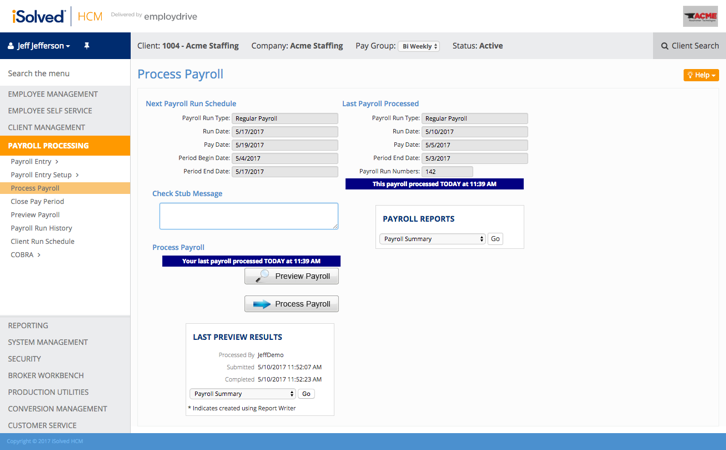 Employdrive was founded by the makers of timeshEASY, now Bullhorn Back Office, and is the only provider of Payroll, HR, and Ben Admin software that is 100% dedicated to the staffing industry. 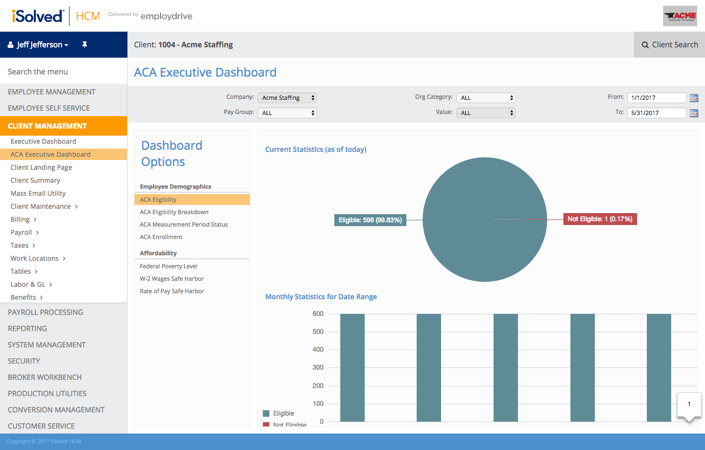 Employdrive focuses on helping customers bridge the gap between ATS, payroll, and benefits and helps to create a more cohesive ACA strategy. World class payroll processing technology is the foundation of iSolved. Built from the ground up in the cloud, iSolved® technology is a solution that ensures your payroll is processed efficiently, accurately, and easily. iSolved’s full payroll preview puts you in control of your own payroll processing, alerting you to potential errors before you process. iSolved is the transformational payroll services solution you’ve been looking for, backed by Employdrive’s expert services. iSolved is the most intuitive, configurable and user-friendly workforce management solution on the market. With Employdrive’s deep understanding of the staffing industry, we can help make your firm more efficient than ever. You work hard to offer a good benefits package to attract and retain the right talent for your customers. Communicating those benefits to your workforce can be straightforward with today’s technology. The more your employees know about their benefits, the more they appreciate them. 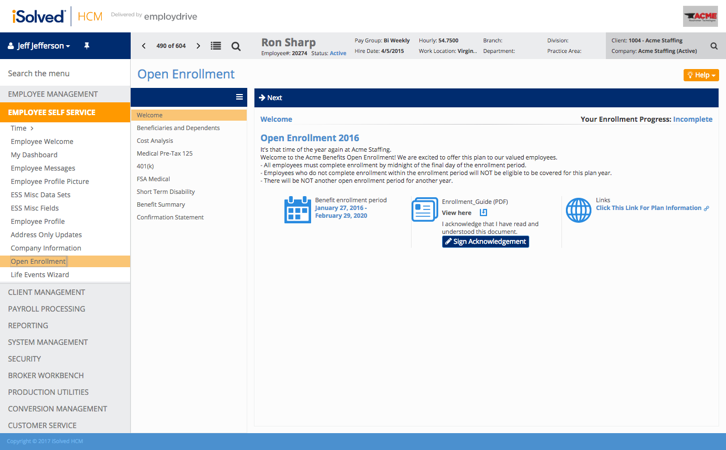 The enrollment process within iSolved increases employee engagement, and includes checks and reporting to help smooth out the complexities of your open enrollment period. 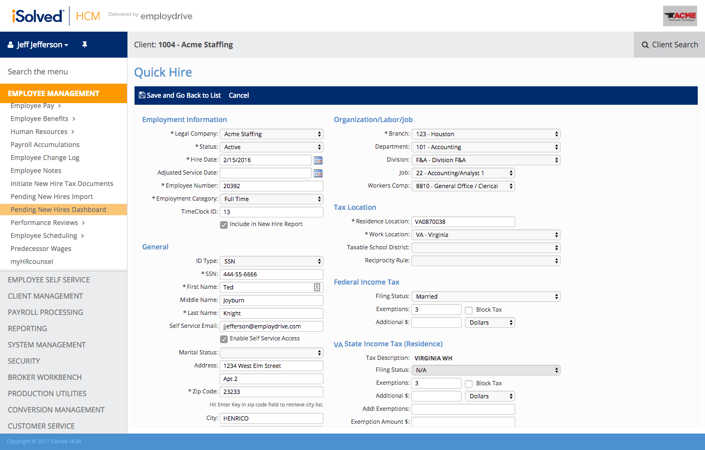 Whatever your benefit administration needs are, Employdrive & iSolved help you manage them. ACA compliance is on every staffing firm’s mind. We help you nail ACA by pulling your Payroll and Benefits administration into one database. Once you and your healthcare broker have put together your MEC and MVP plans, iSolved automates eligibility, enrollment, disenrollment, and affordability management. Paper enrollment, and spreadsheet reporting just don’t cut it anymore. Our integration with Bullhorn and Bullhorn Onboarding virtually eliminates hand keying new hire data into payroll. Much like the Pending status in Bullhorn Back Office, each new placement will show up in our Pending New Hire Dashboard automatically, allowing you to review and approve new hire information. This integration includes any data collected in Bullhorn Onboarding, so Federal and State tax and Direct Deposit information can be integrated directly.